Is 'Heaven' Real, Or Just A Place On Earth? The film Heaven Is for Real tries hard to be about faith, but mostly winds up being about not bothering anybody. It's a shame, because it's a lost opportunity to say something interesting. Is 'Heaven' Real, Or Just A Place On Earth? 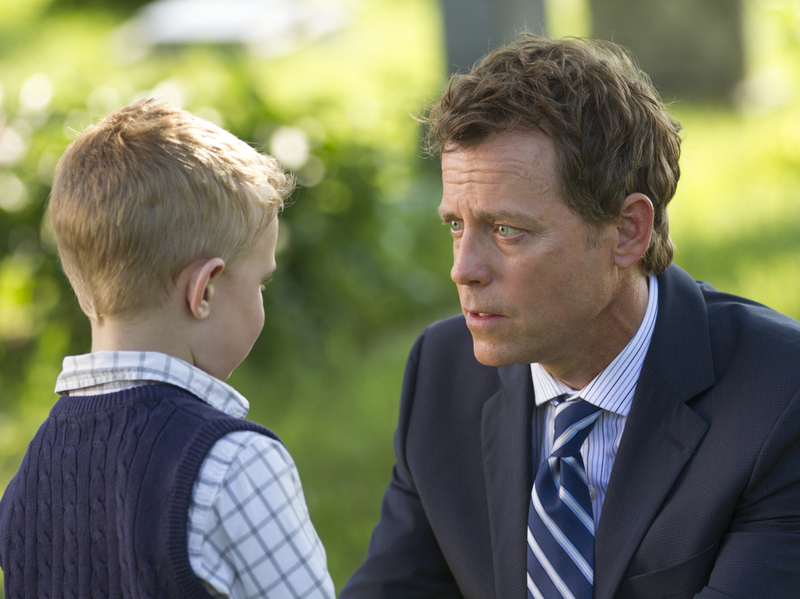 Colton Burpo (Connor Corum) tells Todd (Greg Kinnear) about heaven in Heaven Is for Real. Heaven Is for Real has an earnestness and an inertness that make it something of a bulletproof fish in a barrel. It's easy to take shots at because it's utterly artless and corny, but it's immune to criticism because it's not intended to be otherwise. It's simply intended to be affirming to people who go to church a lot, encouraging to people who go to church a little, and inoffensively irrelevant to people who don't go to church at all. There's no question that Hollywood does a woefully poor job representing people of faith in any sort of nuanced way in mainstream films. Watching the opening scenes of Heaven Is for Real, there's actually a certain charm in its inclusion of scenes of American life that are hugely underrepresented in movies relative to their importance to the potential audience. Pastor Todd Burpo (Greg Kinnear) and his 4-year-old son, Colton, horse around listening to the ladies from church singing hymns in the living room with Todd's wife, Sonja. Todd goes in his sweatpants and T-shirt to the bedside of a dying man and quietly and compassionately prays with him. Todd and Sonja curl up on the couch and talk about how broke they are and the limitations of the house that came with Todd's job. It feels sort of ... fair, to put it simply, to people for whom prayer and church are important. It feels reasonably organic for those first moments. But then, of course, we come to the central plot, in which Colton's appendix bursts and he nearly dies, and when he recovers, he tells his parents he went to heaven. He doesn't say he saw a light or anything similarly vague; he says he sat on the lap of actual Jesus (whom he later clarifies is a blue-green-eyed Jesus, juuuuuust in case you were wondering), he saw angels singing, he saw clouds, and he met some of his deceased relatives. In fact, the perfection with which Colton describes not just the religious heaven but the cultural — perhaps the pop-cultural — heaven is part of what makes it a little bit less persuasive. Even Sonja points out that this is precisely the version of heaven Colton got from every story and song they ever sang to him. But Colton confidently begins going up to, for instance, kids who are hospitalized with cancer and, unbidden, grabbing their hands to tell them everything will be fine, which is received as comforting and welcome for whatever reason, and not as perhaps off-putting from a strange 4-year-old. Todd is presented with a crisis, which is just how literally he should take Colton's story of heaven. He consults an academic who tells him that there are plenty of non-heaven explanations for what Colton described, not that she means to take any "magic" away from him. (The way she sneers the word "magic" is one of a few places when the film has a keen ear for the way religious people are indeed sometimes spoken to that they are perfectly capable of picking up as belittling.) He grills Colton on the experience. He — seriously — Googles "near-death experience." At first, that last move seemed absurd, but I came to think it was charming. I mean, what would you do in such circumstances? Unfortunately, whatever charm the movie has built to this point is overmatched by the gooey sap that's been slathered all over it, not to mention the endless reminders that this is a Sony product. (Never have you seen so many people using Vaio laptops in one movie.) What starts out as a sneaky warmth quickly is swamped by Jesus Is Hiding In That Lens Flare and other far less thoughtful, far more leaden notions. What's more, Kinnear and Martindale have an almost jarringly good moment in which she admits that she's very angry about the fact that Colton lived when her son, who was a Marine, died. It's suddenly a very real scene between these two solid actors, and he builds to the question, "Do you think God loves my son more than he loves yours?" There's something in that scene wanting to poke its head out and be alive, but it disappears back into the mush. If the script had been willing to take a position on its own central conflict — so, does Todd believe Colton traveled in a biblically meaningful way to a separately existing heaven or not? — it would have been on more solid footing. But in the end, its desire not to be too provocative, along with perhaps the vagaries of the true story on which the film is based, leaves Todd somewhere in the middle. He gives a climactic sermon that says ... well, yes, it's real, but that doesn't necessarily mean it's a literal place, because we've all seen heaven in the support of a loving friend, right? This was Colton's heaven. Maybe you have a different one. In other words, the title of the movie should perhaps have an asterisk after it. Or not! Depending! I kind of liked this family. I liked Kinnear, I liked his flock (Thomas Haden Church shows up, along with Martindale), I liked the movie's soft-focus sense of humor in the opening scenes. But it's both too enamored of Colton's heaven and too uncommitted to it, in a way, to really have much to say about faith. Which is a shame, because faith really does remain an underexplored idea.